As I have been preparing for a 2-month long trip to Japan to learn more about tenkara, I have put off writing about a phenomenal backpacking tenkara trip in Montana with Ryan Jordan from BackpackingLight. Ryan was quicker to put his insights “on paper”, and wrote a great post on how tenkara is not only the domain of small streams and small fish. Here is a bit of my account before I board my plane to Japan (by the way, keep checking in, I’ll be writing and posting a lot of pictures and videos while I visit the birth-place of tenkara). If this post seems a bit disorganized – it is. Please forgive me; besides packing, I still have to finish Canadian sales taxes, CA sales taxes, copy for a new catalogue, final procedures and all the fun stuff that a business owner who’s decided to spend a couple of months away learning more about his passion has to take care of. Soon after we introduced tenkara to the US, Ryan Jordan, founder and CEO of Backpacking Light, took notice of tenkara. Initially, I suspect, as a tool; but soon he was hooked by the method. Ryan has since helped introduce a great number of ultra-light backpackers to tenkara and the backpacking community has been quick to adopt the method. Why wouldn’t they? It is as if tenkara had been designed with backpackers in mind, rods collapse down to a mere 20″, are ultra-light at an average of 3oz, all rod pieces nest protected inside the rod’s main segment and it’s very quick to setup and simple to use. 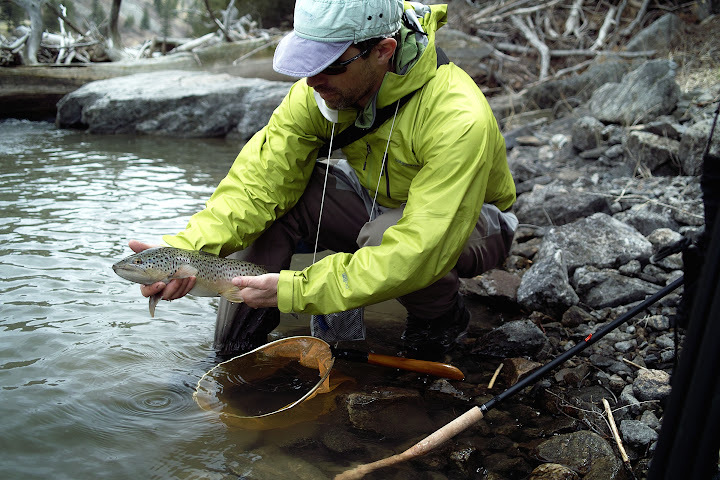 Tenkara is absolutely the right tool for backpacking, and, as most people quickly realize, it’s also the ideal method for mountain stream fishing – small or large. Almost 2 years after Ryan and I started communicating, we finally got a chance to fish together in his homewaters near Bozeman, MT. How this trip came about is a bit of a cool story. A few months ago I noticed some forum users planning a gathering in Utah. I had been wanting to return so asked if I could join. Right before the trip to Utah I called up Brian Flemming, a filmmaker who lives in Bozeman. For sometime now, Brian has been working on a feature documentary film on tenkara and tenkara’s introduction to the US. As we talked about my upcoming trip to Utah he mentioned, in passing, that Montana was not that far. Ohhhhh! I got home that night and booked a ticke from Salt Lake City to Bozeman instead of returning to San Francisco. This would be a great chance to get some backpacking/tenkara footage for his film as well as capture Ryan’s thoughts on tenkara. Tenkara, the film in the making. Brian Flemming shoots as Daniel fishes. Photo by Ryan Jordan. For 2 days we enjoyed great fishing. Together we worked to dispel some of the myths surrounding tenkara, and help affirm some of the aspects of tenkara that most people still receive with skepticism. First, we fished a large mountain stream. Generally people still associate tenkara with small streams. And, yes, it’s great for small streams. I think small streams call for tenkara. However, tenkara is not limited to small streams. For over a year now Tenkara USA has stopped saying that tenkara is made for “small streams”, as that term is vague and not appropriate to describe the ideal waters for tenkara. 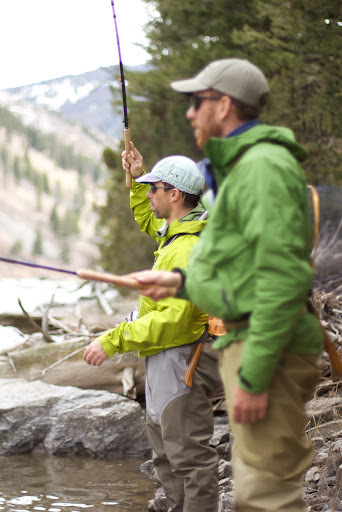 Tenkara is ideal for fly fishing mountain streams. Mountain streams are those that have visible features, normally currents broken up by boulders and other obstacles. The Madison, by definition, is a mountain river, and, like most rivers it can be broken down into smaller sections. The Madison is thus a series of mountain streams running parallel to each other. And, any such stream can be very effectively fished with tenkara. Ryan fighting a nice rainbow on the Madison. Caught using a tenkara fly, of course. During the entire time, the only prolific hatch was that of midges. Size 22 midges covered rocks and formed small blankets on the water in the afternoon. Most people would be tying on similarly sized flies or switching flies to match the hatch. Yet, I stuck with what I have been preaching for over a year and kept my one fly pattern on. Almost the entire time I fished a size 12 tenkara fly. And, this was met with much success. I did have to try several different techniques and found a couple that worked particularly well this time, mostly drifting and stopping the fly for about 2 seconds., covering about 5-6ft at a time. I was also pleased to see Ryan, who at one point was a professional fly-tier and knows the waters well, sticking with a small selection of tenkara-only flies. We fished these flies and stuck with them. Ryan with a nice one caught on a tenkara fly as midges hatched everywhere. On each of the days, Ryan and I caught several trout over 15″, and I was lucky to hook a couple of 19″ brown trout. Both trout were handled very quickly and extremely effectively with tenkara. My experience fighting fish of that type of size is very limited. And Ryan can probably talk more about tackling large fish with tenkara, as he does live in the state where they all seem to be on steroids. However, even though tenkara’s sweet spot is for targeting the “usual” mountain stream trout (i.e. <18″) tenkara is a VERY effective tool for catching and fighting just about any trout found in those waters. This is especially true if one is using the right tool, in this case the Amago rod for targeting larger fish. My first 19″ brown, pictured on top, was caught using the Amago. With good technique, which I must say I have acquired over the last couple of years, such fish can be handled at ease. That fish was landed much more quickly than one would land it if using a reel. The fish wants to run, and it was a strong fish, but it can’t take line. So, it truly is angler v. fish. On the second day I was using our newest rod, the Ito, which was designed for smaller fish. The Ito is a softer rod and I wanted to put it to the test. I hooked another brown of exactly the same size, and actually, in the same exact place. The Ito, as expected, took a little longer to handle the fish, but still very comparable to using a reel. 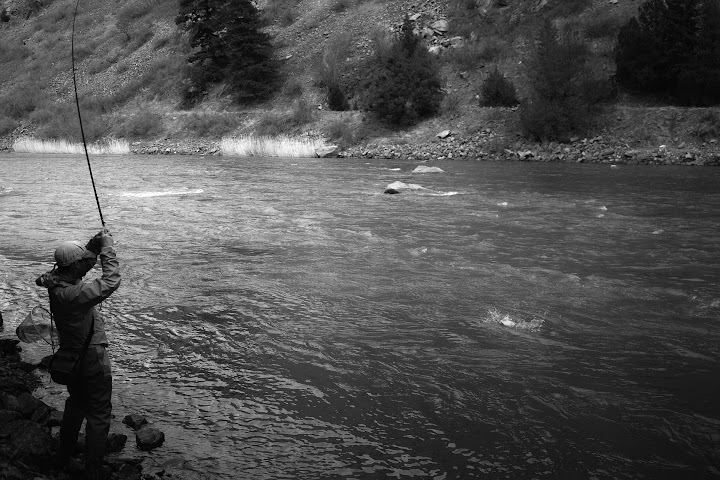 The rod performed beautifully and the method did not disappoint in challenging the large and strong fish of Montana. The plan was to hike in about 3.5 miles along the Madison, in an area called the Beartrap. We’d fish for 2 days and raft back to the car. Tenkara was, of course, the primary goal of the trip. But, one of the coolest things about backpacking light is how one can carry less but do more. 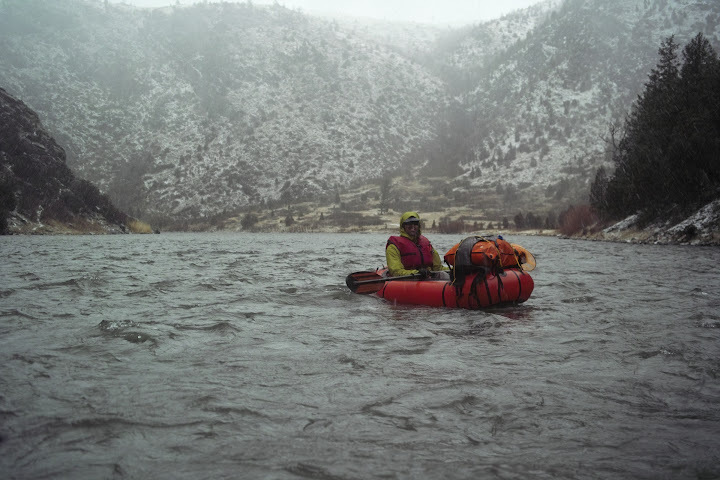 In addition to fishing gear, we also carried personal inflatable rafts in our packs. Packrafts. In total I’m guessing our packs weighted about 20lbs with food, the rafts, shelter, and our tenkara gear. This would be my first time giving packrafting a try. Despite of having to wait for a 15 minute massive hail storm to pass, and then rafting down the river in freezing temps with heavy snowfall I got hooked. Packrafting just seems to be such an efficient way of covering water. The packs are inflated very quickly with inflating bags that quickly press a lot of air into the rafts, working like giant, ultra-light bellows. The backpacks were tied to the front of the boat, as we sat on the back. And, downstream we went. We didn’t fish on our way downstream. 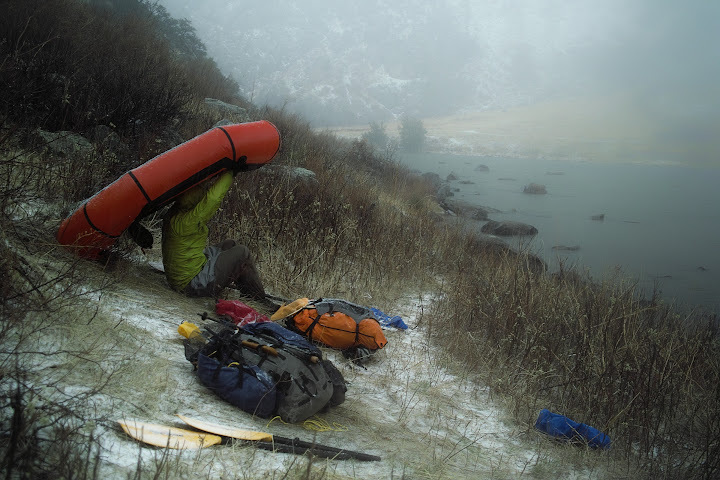 I personally much prefer to fish as I walk than from any type of boat, but packrafting does require attention and it would be difficult to fish from one. A classic shot, Ryan Jordan waiting out the hailstorm before putting in. If you want to experience tenkara in Montana, make sure to come to our Tenkara Summit on August 27th, in West Yellowstone, MT. And, stay tuned for more information on tenkara the film. This is a project by Brian Flemming and expected to be released in 2012.